The renovation market for condominiums is expected to grow even more in the future thanks to an increase in the condominium stock and an enhancement in the living environment. On the other hand, there is also a need to improve renovation technology including building safety, quality maintenance and environmental friendly measures. Haseko is actively developing and proposing various technologies related to renovations. Condominium built more than twenty years ago primarily use galvanized steel piping for their piping material and in the case of condominiums more than thirty years old the piping will have water leaks due to corrosion of the piping itself or due to clogging. Therefore there is a need for renovations, either a replacement of the piping or improvement of the piping by applying a coating to the internal surface of the piping. However, replacement of piping has various inherent issues including the fact that it is very expensive and that the construction period is long. As for maintenance of the piping, there are concerns over the reliability of the work and guarantees. There is also the problem that alternative doesn’t exist if the piping has deteriorated excessively. 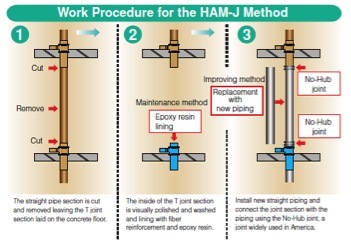 Haseko has jointly developed a new method that combines the merits of conventional upgrading and maintenance methods. This method has been highly appraised by management associations and others for its durability, reliability, short construction period that allows residents to remain in their units during the work period and the small construction noise among other reasons.